﻿ 3 Steps to Writing Nonprofit Email Campaigns » Red Mango Marketing! As a nonprofit, your schedule is more than jam packed – but now is the time to sit down and write an email for your marketing efforts. Your goal of this email is to to tell a story that builds a connection and inspires your supporters to take action. You’ve probably figured out the topic for your email, but still need to develop the content. This can seem intimidating when you don’t know where to start. We’ve got you covered! This simple 3-step formula will take the stress out of writing email campaigns. Whether you’re asking for donations or writing an informational email, just answer the question listed for each of the following steps. Step 1. Headline – What are you trying to accomplish? As the largest text of your email, the headline should state your purpose so that people understand what your message is about. It should be a quick line of text that encourages your contacts to read further. Check out this headline that Loveland Charity used. They wanted to let their supporters know about their upcoming volunteer opportunities. It’s short and gets the point across to the reader immediately. Step 2. Message body – Why should the reader care? Under the headline is your message body. This is where you want to provide a brief description that elaborates the goal of your message and why the reader should care. Remember, your text should remain short and sweet. Provide just enough information that helps them to make an informed decision to support your organization. In the example from Loveland Charity, they provide a brief description of each volunteer opportunity and include the day and time. Then, they tell their readers to click the link to sign-up, letting them know exactly what you are asking them to do. Step 3. Call to Action – How can the reader get involved? People join your mailing list because they want to support your cause. The call-to-action, or CTA, is designed to drive the reader towards an action, whether that is to click a link, read a blog, get more information or get in involved. Invite them to be a part of your mission and tell them what you want them to do after reading your email. In this example the call to action is to “Sign up to volunteer.” It uses action-oriented words and links to the website where the reader can fill out the required information. Not sure which topic to write about? Even if you’re not sure of your topic, these questions will help you quickly write an effective email. Use Step 1 to think about the next goal for your organization. If you’re not immediately looking to raise funds, send an informational email. Let your supporters know what you are working on or even the results of your last fundraising campaign. Keep in mind, you should be sending on a regular basis and at least twice a month so you can continue to build relationships with your supporters. You’re now ready to create and write your next email campaign. Spend a few minutes to answer these 3 questions and you’ll have your email finished in no time without the extra stress. 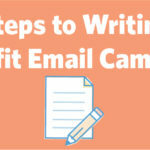 The post 3 Steps to Writing Nonprofit Email Campaigns appeared first on Constant Contact Blogs. This entry was posted on Tuesday, July 31st, 2018 at 8:00 am	and is filed under Email Marketing, News & Updates, Nonprofit. You can follow any responses to this entry through the RSS 2.0 feed. Both comments and pings are currently closed.